management: Mainframe Products for Monitoring Composite Applications? Applications that run in more than one application environment, or access data from more than one database manager present new challenges. Monitoring performance, solving problems or future planning of these composite applications will often require a monitoring product. This article compares the three main products for applications with z/OS components: ITCAM for Transactions, BMC Transaction Analyzer and CA Cross Enterprise APM. The traditional 3270 mainframe transaction running in a single CICS or IMS region is becoming a story of the old days you tell your grandchildren. Today mainframe applications increasingly access remote resources. These resources may be transactions, applications or data in a different region, system or platform. For example, CICS MRO and DPL allow transactions to call other CICS transactions in remote regions on any z/OS within a sysplex or VTAM network. Websphere MQ and SOAP push these boundaries further, giving transactions access not only to other mainframe applications, but distributed applications and services as well. It's not one-way traffic. Companies interested in getting more from mainframe assets are looking closely at accessing them from distributed applications. Middleware like IMS Connect and CICS Transaction Gateway further open up mainframe transactions. The waters get more muddied with dynamic routing technologies. These range from dynamic workload sharing with IMS CQS and CPSM to Enterprise Service Bus products, TCPIP redirection and Websphere Message Broker. In many cases, it is impossible to know exactly which application will service each individual request. Monitoring these composite applications is a hard ask. The traditional approach of monitoring at the transaction and database manager level often isn't enough. Information about every step of each individual composite unit of work is needed. IT staff need to know where it went, how it got there, what processed it, which database managers were accessed, and how long each step took. In reality, such monitoring without application program changes needs a commercial composite application monitoring tool. For composite applications with a mainframe component, the three main players are IBMs ITCAM for Transactions, BMCs Transaction Analyzer, and CAs Cross Enterprise APM. This article takes a look at these three products. Past versions have not worked together, operating in isolation with their own separate data processing and GUI front-end. ITCAM for Transactions looks to fix this. It rolls the RTT, IMS and CICS products together, adding internet service monitoring and a few other features. It uses IBM's Tivoli Monitoring (ITM) framework to store, process, archive and display the data. This gives users a common screen to see all monitoring information, including that from other Tivoli products. ITCAM for Transactions differs from the other products in that it provides out-of-the-box tracking  no other software (other than ITM) needed. This out-of-the-box monitoring for z/OS related components includes IMS, IMS Connect, CICS, CICS TG, Websphere MQ, and Oracle Tuxedo. Additionally, it covers Websphere Application Server and SOAP based applications on z/OS. This extra coverage requires ITCAM for Websphere and ITCAM for SOA respectively  separately priced products. Unfortunately, ITCAM for Websphere does not use ITM, and retains its proprietary data processing and GUI. It's hard to see IBM allowing this continue for much longer. Distributed coverage lags a little behind the competition, including .NET, Websphere Application Server, and ARM-enabled applications. Customers lucky enough to have products such as Omegamon for IMS and Omegamon for CICS can quickly jump to their screens with the correct context from ITCAM for Transactions workspaces. Sooner or later users will find composite applications that use an unsupported way to communicate. This could come from an unsupported software product, or a home-grown communication system. Either way, this will create a blind spot when monitoring the application. ITCAM for Transactions is alone in offering an API to allow users to fill these gaps for themselves. Languages supported are High Level Assembler, COBOL, PL/1, Java, and C. Unfortunately, IBM has not included information to allow these custom solutions to link with data already obtained by ITCAM for Transactions. BMCs MAINVIEW Transaction Analyzer monitors mainframe transactions, including composite application information. BMC aren't giving much away, declining to provide any details other than brochures available on the web. However from this evidence, Transaction Analyzer uses other BMC MAINVIEW products to monitor IMS and CICS transactions. This includes Websphere MQ and DB2 support. Analysis of response time information for composite applications can be viewed in 'near real-time.' Hyperlinks jump to relevant BMC MAINVIEW screens for more detailed analysis. BMC also provides some non-mainframe composite application monitoring using their Transaction Management Application Response Time Enterprise Edition product (BMC TM ART). Designed as an end-to-end availability and response time monitor, it generates 'synthetic' transactions which are monitored for performance. However this doesn't help users needing to monitor production traffic. BMC say nothing about its ability to display a complete picture of an entire composite application, raising some doubts. Screens with topology information, including detail on every step and how long it took is a prerequisite for any serious composite application monitor. BMC supports an impressive array of application environments and database managers, including Oracle PeopleSoft, Oracle Tuxedo, Siebel, Oracle Database and DB2. However middleware technologies such as Websphere MQ, SOAP, or Enterprise Service Bus products are handled by other products. The biggest disadvantage is that at these two products currently do not work together. BMC has no solution to track composite applications that operate on both mainframe and distributed platforms. According to BMCs 2006 Transaction Management brochure, this will be fixed some time in the future. The CA SYSVIEW Performance Management range of products have monitored CICS and IMS transactions, and CA Datacom databases for some years now. This monitoring currently includes some composite application information. DB2 related information can be added with CA Insight for DB2. On the distributed side, CA Wily Introscope is the product monitoring composite applications. It covers an impressive range of application environments including Microsoft .NET, Oracle Application Server, SAP Netweaver and JBOSS. The base product can also monitor SOAP applications, and handles Enterprise Service Bus software like Websphere Enterprise Services Bus and Oracle Service Bus. Separately ordered Powerpacks add support for Oracle Database, Websphere Application Server and Websphere MQ. CAs brand new Cross Enterprise APM is the glue that brings these two products together, making CA solutions far more attractive. With Cross Enterprise APM, CA Wily gets and displays SYSVIEW information by periodically polling the relevant products. This allows CA Wily to show information on the complete composite application on one screen. Currently, full composite application 'tracing' is only available for CICS/CICS TG transactions, and needs CA SYSVIEW Performance Management Event Capture Option and CA SYSVIEW Performance Management Option for CICS. Tracking of Websphere MQ traffic on both mainframe and distributed platforms is also fully supported. IMS Connect support is scheduled for future releases. There are other products competing in the composite application monitoring market, including Oracle's Composite Application Monitor and Modeler (OCAMM) and Sun Java Composite Application Platform Suite. However mainframe users have a more limited choice. BMCs MAINVIEW Transaction Analyzer is limited to IMS and CICS transactions. This leaves a sizeable gap for customers looking to monitor applications that operate on both mainframe and distributed platforms, or those with Websphere Application Server applications. 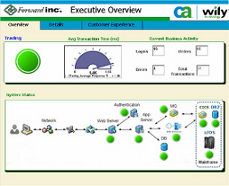 CA Cross Enterprise APM has no such limitation for CICS transactions, connecting the mature CA Wily and CA SYSVIEW products together. CA Wily would have to win the distributed coverage stakes, handling an impressive range of application managers and middleware. IBMs ITCAM for Transactions is refreshing in that it doesn't require other products (other than ITM) to work out of the box. However for extended coverage, other Tivoli monitoring products are required. It is comfortable with applications that include both mainframe and distributed processing. What's more, it is the only solution supporting Websphere AS and SOAP on z/OS. If IBM publish enough information to use its API for custom solutions, they will have a big advantage for users with unsupported composite application segments. Mainframe users will be particularly interested in performance. Many monitors designed for distributed workloads have suffered when faced with thousands of mainframe transactions per second. Mainframe CPU consumption, distributed hardware requirements and ease of use will also be key issues to ask when considering these products. Disclaimer: David was a developer with IBM on mainframe components of ITCAM for Transactions between November 2007 and March 2009.
management	: Mainframe Products for Monitoring Composite Applications?